New Wave Fabrication offers a wide range of products and services because of its diverse manufacturing equipment and more importantly, a team of highly skilled, certified craftsmen and engineers. Offering welded parts, small accessories, custom mounts, stairs, ladders and upgrades of all kinds, New Wave is an excellent fabrication resource for yacht and boat owners, and mariners worldwide. 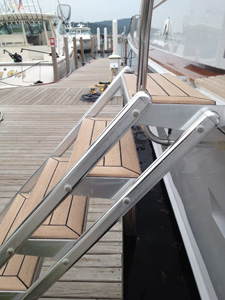 Experts in Boats, Yachts, Stairs and Ladders! New Wave designers and builders have worked closely with expert boaters and sailors for many years. They listen to these captains and operators and provide exactly what is needed for safe operation, style and comfort at all times on the water. The customer is always right with New Wave Fabrication. 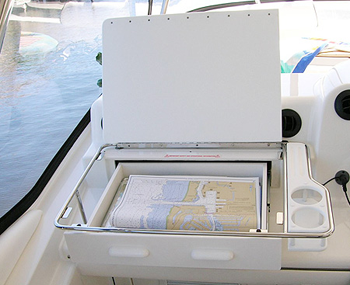 New Wave can repair older boats, assist in major renovations, and can frequently manufacture custom parts that may be out of production, or even produce brand new designs for your yacht or boat. New Wave offers custom built stairs and ladders. New Wave can even custom design and build a full production assembly to specific dimensions or simply sell the certified parts and labor that will keep you motoring the high sea. With diverse expertise, tools, equipment, and a knowledgeable team of experienced professionals, there is virtually no yacht or boat project too large for New Wave. Contact New Wave today with any questions about design, production, manufacturing, installation, repair and fabrication of virtually all marine products. What sets New Wave apart from its competitors? New Wave stairs and ladders are lighter in weight than anything on the market, and are also less expensive. All stainless steel fasteners are installed with a nylon bushing to eliminate electrical activity. Competitors may drill stainless steel bolts directly into aluminum extrusions causing corrosion and failure. But with New Wave, installation is guaranteed. Parts, fasteners, boat products and yacht accessories can easily be switched out to avoid costly replacements to your seafaring vessel. New Wave representatives will never sell you an entire stair or ladder when all you actually need is one simple bolt. Work with the Best in Marine Supply! New Wave has a lengthy track record with many satisfied clients from all around the World. The gifted craftsmen at New Wave have seen virtually all types of projects, small to large, simple to complex, involving multiple types of materials or a custom ladder with teak inlay. Simply put, they have seen it all in the marine supply industry and have a long history of accomplishment, service and success on all levels. What started as a small manufacturing shop in Boynton Beach has grown into a leading custom contract manufacturer serving the entire nation and even worldwide.